From 1977 to 2003 he composed the cycle of operas LICHT (LIGHT), The Seven Days of the Week, which comprises about 29 hours of music. All of the seven parts of this music-theatre work have had their staged world premières: DONNERSTAG (THURSDAY) in 1981, SAMSTAG (SATURDAY) in 1984, and MONTAG (MONDAY) in 1988, all three produced by the Teatro alla Scala in Milan; DIENSTAG (TUESDAY) in 1993 and FREITAG (FRIDAY) in 1996, both at the Leipzig Opera, SONNTAG (SUNDAY) in 2011, at the Cologne Opera. With MITTWOCH (WEDNESDAY), the Birmingham Opera Company presented the last day of the LICHT heptalogy on Wednesday, August 22nd 2012. After LICHT, Stockhausen intended to compose the hours of the day, the minute and the second. He began the cycle KLANG (SOUND), The 24 Hours of the Day, and until his death in December 2007, he composed the 1st Hour HIMMELFAHRT (ASCENSION) to the 21st Hour PARADIES (PARADISE). A quiet and spaciously composed continuity of sounds is disturbed six times by a short refrain. This refrain contains glissandi and clusters, trills, bass notes (in the piano) and brief snatches of melody, elements which are absent from the first form. The points at which the refrain is played are chosen by the players themselves and can change from one performance to the next; once they are fixed, however, the final shape of the refrain will be influenced by its immediate context (thus trills, glissandi and melody should be based on notes of the chord standing before or after the refrain in the text); conversely, every time it has sounded, the refrain exerts a modifying influence on the music which follows it: the characteristics of piano, celesta and vibraphone sounds are altered by the intervention of ‘colouring’ percussion instruments, this happening in increasing or decreasing degrees depending on the points chosen for the refrain’s entry. Thus, within a static condition, a dynamic formal process is awoken by unforeseen disturbances; and the one influences and leaves its mark on the other without any conflict arising. Those who want to understand what I have written in Refrain for three performers will need to read the score. Those who want to understand how the performers interpret my score will need to know the score and compare it with performances. Those who simply want to hear a piece of music (and not understand it) need only listen. What else remains to be said? The work was commissioned by Dr. G. von Westerman for the Berlin Festival and was written in June and July 1959; it is dedicated to my friend Ernst Brücher. 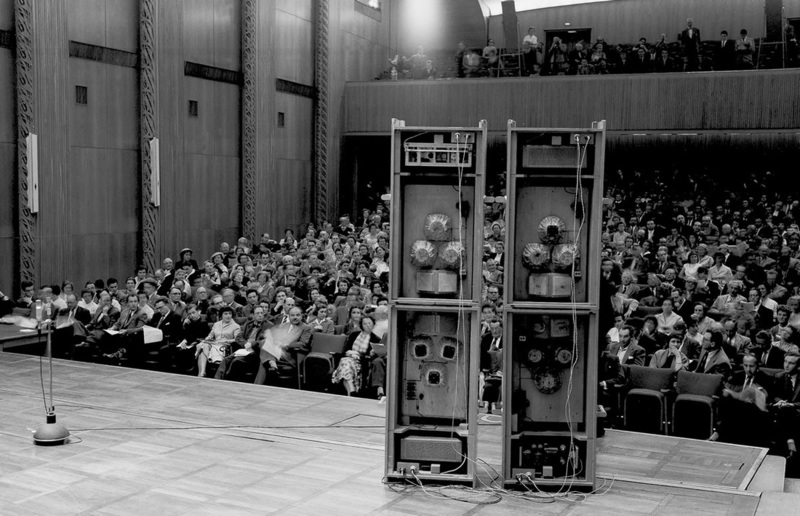 The first performance otook place in Berline on October 2, 1959; the performers were David Tudor (piano and wood blocks), Cornelius Cardew (celesta and antique cymbals) and Siegfried Rockstroh (vibraphone, cowbells, and glockenspiel). Since then, Refrain has had frequent performances in different versions and with different instruments. Kreuzspiel dates from Autumn 1951 and was first broadcast by WDR Cologne shortly afterwards. The first public performance at the Darmstadt Summer School in 1952 ended in an uproar. Influenced by Messiaen’s Mode de valeurs et d’intensites and by Goeyvaerts’ Sonata for two pianos, Kreuzspiel is one of the first compositions of ‘pointillist music’. The idea of an intersection (crossing) of temporal and spatial phenomena is presented in three stages. 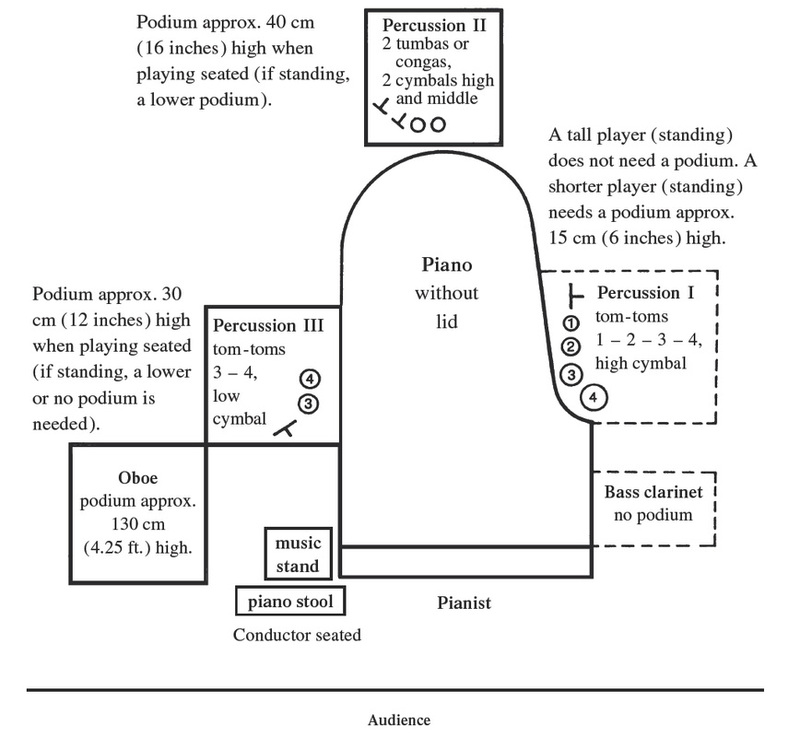 In the first stage (2’40”) the piano begins in the extreme registers and through a crossing of registers gradually brings into play six ‘bottom’ notes and six ‘top’ notes; the four middle octaves lying within the ranges of the oboe and the bass clarinet take over more and more notes, and at the moment when all the notes are equally distributed over the entire range of sound, all the duration and intensity series have crossed over in such a way that, from the initially wholly aperiodic series, there arises a series of regularly diminishing durations and one of regularly increasing intensities (accelerando and crescendo); a woodblock makes this still more evident. The whole phenomenon then reverses itself in mirror form, so that by the end of the first stage all of the notes have arrived once again in the extreme registers of the piano; however, as a result of the intersection, the six ‘top’ notes have changed places with the six ‘bottom’ ones. The tomtoms pursue intersecting paths within opposed rhythmic and dynamic series, moving from longer and softer to louder and shorter, and vice versa. 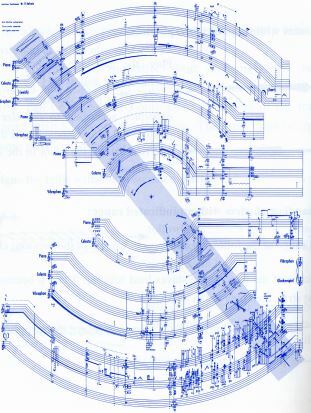 Whenever notes and noises meet in a single sound—and that is fairly often—the systematic course of the form is dislocated: a note gets into a wrong register, or its duration or intensity contradicts the series, etc. In the second stage (3’15”) the entire formal phenomenon just described is turned inside out: everything starts in the middle octave with oboe and bass clarinet, then stretches out towards the extreme registers (piano) and back again; drums become cymbals; the regular pulsation of the first stage, in which the smallest given duration served to determine the tempo, is dropped. In the third stage (4’) the two phenomena are combined with each other. 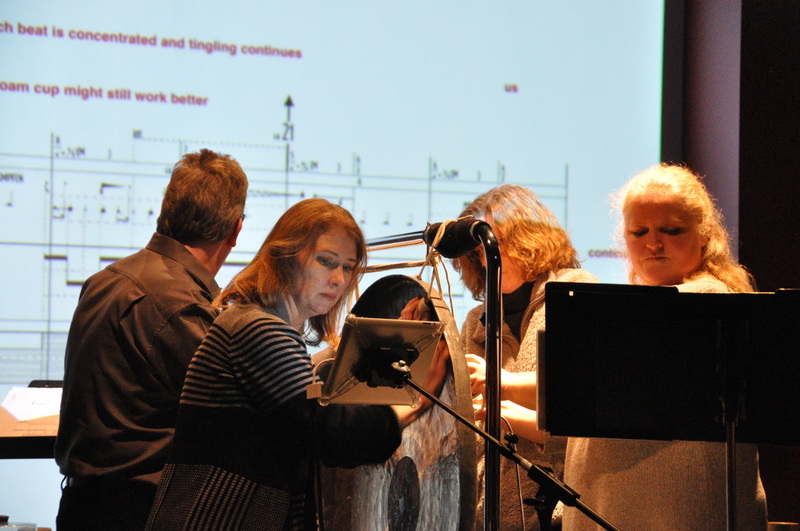 After finishing the score of MIXTUR for orchestra and ring modulators, I searched for ways to compose – flexibly – also the process of microphone recording. The microphone, used until now as a rigid, passive recording device to reproduce sounds as faithfully as possible, would have to be come a musical instrument and, through its manipulation, influence all the characteristics of the sounds. In other words, it would have to participate in forming the pitches – according to composed indications – harmonically and melodically, as well as the rhythm, dynamic level, timbre and spatial projection of the sounds. In 1961, I had purchased a large tam-tam for the composition MOMENTE and set it up on the balcony and later in the garden. Time and again I would make experiments in which I excited the tam-tam using a great variety of implements – of glass, cardboard, metal, wood, rubber, plastic – which I had collected from around the house. One day I took some equipment from the WDR Studio for Electronic Music home with me. My collaborator Jaap Spek helped me. I played on the tam-tam with every possible utensil and during this, moved the microphone above the surface of the tam-tam. The microphone was connected to an electrical filter whose out put was connected to a volume control (potentiometer), and this in turn, was connected to amplifier and loudspeaker. During this, Jaap Spek changed the filter settings and dynamic levels, improvising. At the same time, we recorded the result on tape. This work was the genesis of a live electronic music with unconventional music instruments. On the basis of this experiment I wrote the score of MIKROPHONIE I. Two players excite the tam-tam using a great variety of implements, two further players scan the tam-tam with microphones; and an appropriate notation prescribes the distance between the microphone and the tam-tam, the relative distance of the microphone from the point of excitation, and the rhythm of the movements of the microphone. Two further players– seated in the auditorium–each operate an electrical filter and two potentiometers. They, in turn, reshape the timbre and pitch, dynamic level, spatial effect, and the rhythm of the structures. In this way three mutually dependent, mutually interacting and simultaneously autonomous processes of sound-structuring are connected with each other. These were composed to be synchronous or temporally independent, homophonic or polyphonic layers. 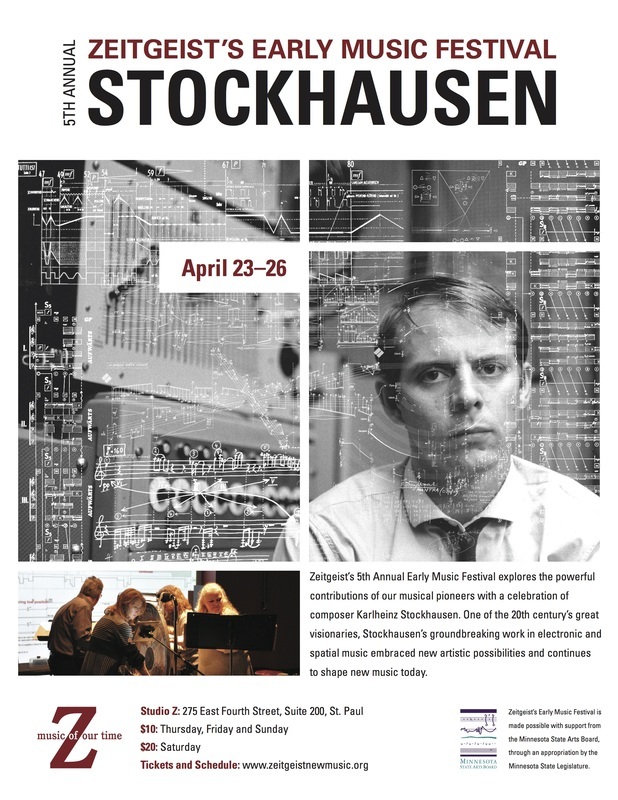 Karlheinz Stockhausen's Licht (Light), a cycle of seven operas representing the days of the week. Consisting of 29 hours of music, the composer described Licht as an "eternal spiral" with no beginning and no end. 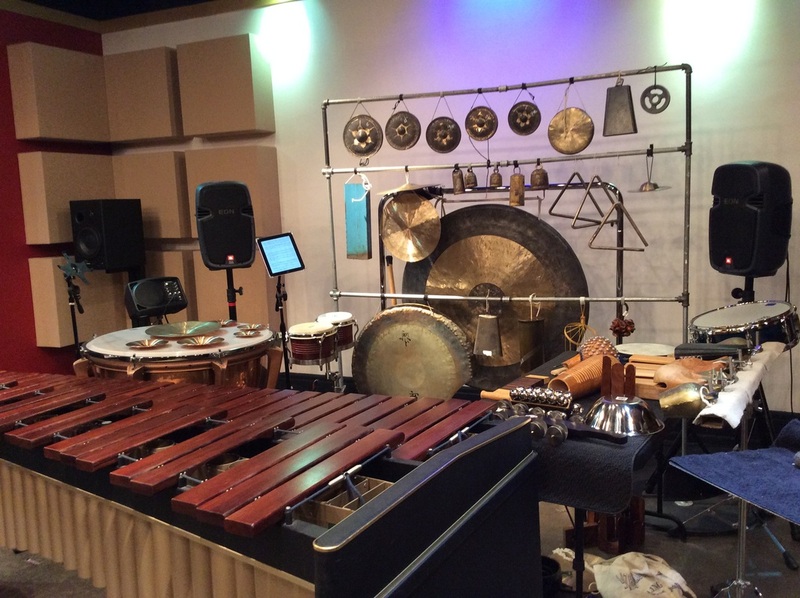 Excerpts from Freitag (Friday) will be performed at Zeitgeist's Early Music Festival, including Komet, a percussion solo, Vibra Elufa for vibraphone, and Klavierstuck XVI for piano. Stimmung for six vocalists was the fruit of a commission from the ‘collegium vocale’ of Rhenish Music Schools in Cologne. The score was written during February and March 1968 at a house on Long Island Sound in Madison, Connecticut. I used texts which I had written in love-bitten times during April 1967 in Sausalito, San Francisco, and on the sea-board between San Francisco and Carmel. The Magic Names were collected for me by the young American anthropologist Nancy Wyle. Once the musical draft was complete, I chose the title ‘Stimmung’, which bears many meanings: true intonation, for the vocalists have to sing the 2nd, 3rd, 4th, 5th, 7th, and 9th harmonics of a low Bb fundamental; the tuning up with which a vocalist always begins when he contributes a new ‘model’ of sound to the context; the tuning in, or attuning, of rhythm, dynamics, and timbre while a Magic Name which has been freely added to the context is being integrated into it; and—not least of all—there is in the German word ‘Stimmung’ the connotation of ‘atmosphere’, ‘ethos’, ‘spiritual harmony’; moreover, in the word ‘Stimmung’ is hidden ‘Stimme’—‘voice’! In several months, the singers learned an entirely new vocal technique. The notes actually sung must be as soft as possible, and specific overtones—indicated by a series of numbers from 2 to 234 and by series of voice sounds taken from the phonetic alphabet—must emerge as strongly as possible. 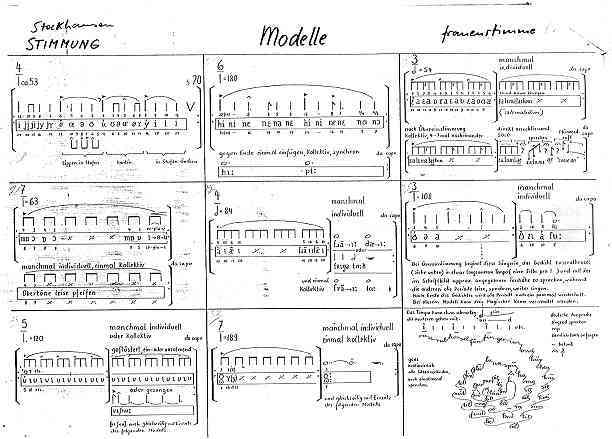 Each singer has 8 or 9 models and 11 Magic Names which—in accordance with a ‘formal plan’—he can bring into play freely as the context may suggest, and to which the others respond with ‘transformations’, ‘varied deviations’, ‘pulsations’ and ‘assimilation’. In any given combination of voices, the singer of the model always takes the lead, passing it on to another singer when he feels that the right moment has come. After a singer has ‘called’ a Magic Name, it is periodically repeated in the same tempo and with approximately the same articulation as the model until it is finally assimilated, and thus integrated into the model prevailing at the time. Stimmung is indeed meditative music. Time is suspended. One listens to the inner self of the sound, the inner self of the harmonic spectrum, the inner self of a vowel, the inner self. The subtlest oscillations—barely a ripple--all the senses are alert and restful. In the beauty of things sensual shines the beauty of things eternal.